The IP Rights Office has issued a warning relating to a copyright scam being conducted through the website http://www.icpbb.net. ICPBB issues forged copyright registration certificates which claim to be issued by the IP Rights Office, but which are not. They also issue fake CRS registration numbers which they claim can be verified on this website, but which are not issued by the IP Rights Office and do not appear in our database. The wording of the genuine certificate has been copied, but the background has been altered and the CRS and IPRO seals have been replaced with ICPBB logos. 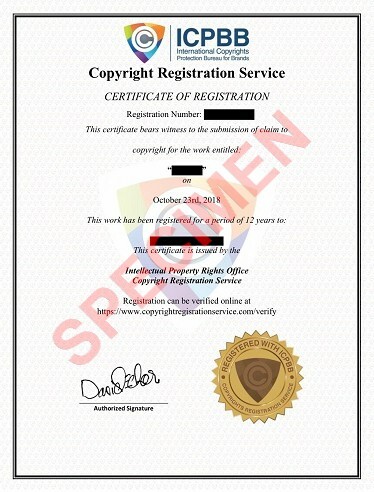 Despite the removal of these seals, the forged certificate continues to claim that it is "issued by the Intellectual Property Rights Office Copyright Registration Service", and that "Registration can be verified online at https://www.copyrightregistrationservice.com/verify". Neither of these claims are true. 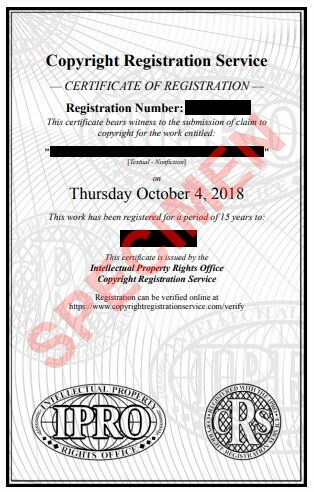 The registration numbers quoted on these certificates are not recognized by the IP Rights Office, and the "authorized signature" is not the signature of anyone involved with the IP Rights Office. Genuine certificates issued by the IP Rights Office are designed to be printer friendly, and as such are always black and white. They never contain color. Genuine certificates always include a registration number which you can verify on the verification page. If there is no registration number, or the registration number cannot be verified on the verfication page, or the details returned refer to a different work, then the certificate is not genuine. If you have paid for a registration recently and have been issued with a non-genuine certificate like those issued by ICPBB, you should contact your card issuer and ask to reverse the payment on the grounds that the service was fraudulent and misrepresented. If your payment was not within the last few months then unfortunately you may not be able to recover your payment, but in either case you should notify the relevant law enforcement authorities in your local jurisdiction. To take out a genuine registration with the IP Rights Office, click here.